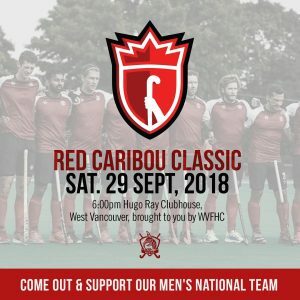 Support the Men’s National Team at the Red Caribou Classic! Come out and support the Canadian Men’s National Team at the 1st Annual Red Caribou Classic! This fundraiser, hosted in partnership with the West Vancouver Field Hockey Club, will support the Men’s National Team on the road to the FIH World Cup in Bhubaneswar, India. The event will take place at 6 PM on Saturday, September 29th at Hugo Ray Park in West Vancouver. Tickets are free for children under the age of 15 and $20 for adults, with dinner and a drink included in the entry fee. All proceeds will go towards supporting the Men’s National Team. For more information or to purchase your tickets, click here! Posted in Clubs, NEWS, Uncategorized.